As a business owner or the manager of a shop, it can be frustrating once you total-up how much money you spend per month on lighting. Although it is essential for a retail store, lighting can be expensive and account for a large chunk of your commercial energy bills; unless you’re using LED lights. Known officially as a Light Emitting Diode, LED lights are much brighter than traditional incandescent or halogen bulbs and are much more energy-efficient. This means that your retail store can experience reduced electricity costs due to withdrawing less power from the grid. Once you discover how much money your shop can save through using LED lighting, you may find our business energy comparison allows you to cut the costs even further (by as much as 60%!). With the average lifespan of an LED bulb being around 25-30 years, there’s no requirement to constantly monitor the health of your bulbs (unlike incandescents). 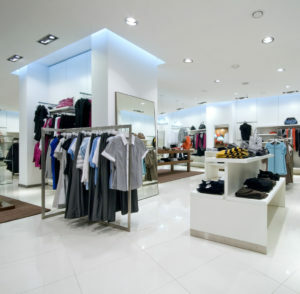 In a retail outlet, it’s important that lighting is maintained and of a good level. If not, your customers could be turned away and result in a loss of business. LED lights are much brighter than traditional bulbs, making them a great option for those looking to reduce their shop electricity costs whilst still having a high-quality supply. Many businesses are concerned about the amount of Infrared and Ultraviolet radiation that is given off by CFLs. However, you can rest assured knowing that the health of your staff and customers isn’t at risk as LED lighting doesn’t emit any kind of harmful radiation. How can shops use LED lights? As retail stores tend to have a number of shelves to display products, LED lights can be used to highlight and draw attention to the area. Acting as spotlights in certain areas of the shop. Aids with psychologically encouraging people to purchase. Provide customers with better colour perception. This allows them to get the most out of the products in your store. Now that you’ve discovered the benefits and best application for LED lighting in a shop, it’s time to start finding a suitable energy provider who is able to supply your shop at the best possible price.